The cabinetry in your kitchen is built to last, providing years of convenience and quality for your space. These handy storage units can be updated and replaced to enhance the aesthetics of your kitchen, yet most homeowners prefer to avoid replacing their cabinets. Taking proper care of your kitchen cabinets can result in numerous benefits as time goes on, preserving the quality and helping your products to last as long as possible. As professional providers of cabinet refacing to Atlanta, Dunwoody, and beyond, Detail Design & Remodeling is here to serve as Georgia’s go-to team of home remodeling contractors. From cabinet refinishing services to new construction and custom cabinet work, our renovators have the skills and experience needed to provide the best results for your space. We’re here to earn your business with hard work, respect, and integrity, and our cabinet refinishing services are here to transform your kitchen. Outside of kitchen cabinet refacing, you have a wide range of tasks that can prove beneficial in keeping your cabinets in quality condition. 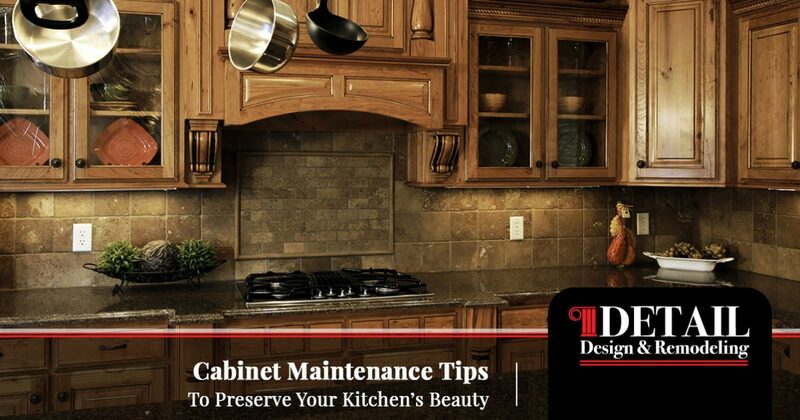 Today, we’ll highlight a few cabinet maintenance tips that will be helpful in increasing the longevity and aesthetic beauty of your kitchen cabinets. If your home is in need of quality kitchen renovation services, be sure to reach out to our contractors in Dunwoody today! Regular cleaning routines can prove helpful in keeping the surfaces of your cabinet clean and clear of grime. Dust and grease can quickly build up when left untouched, creating a sticky film that can be very hard to remove. In some cases, this layer of gunk can actually result in damages during the cleaning process! Letting dirt and debris settle in your cabinets can also reduce their longevity, as these contaminants can slowly infiltrate the finish of your doors and boxes. When using a cleaner, check that it is safe for your wood cabinets. Failing to do so can result in serious surface problems that can completely sabotage the purpose of your cleaning plans. We also recommend using a different device other than your kitchen sponge, as this item is likely full of food and grease. Be sure to continually clean your cabinets inside and out to keep them strong and shiny for years to come! Water is often the bad guy when it comes to protecting your home from mold, rot, warping, and more. While your cabinets are not often at a high risk for moisture exposure, tasks such as cooking, running the dishwasher, and washing your hands can result in a high amount of steam. Over time, this steam can begin to saturate your upper cabinets, causing warpage and rot. We recommend installing a hood vent in your kitchen to help remove this excess moisture from the air. Your lower cabinets can suffer as well, especially if you rest your wet dish towel over the door. We recommend finding a new place to hang that towel, such as the stove or a drying rack. Beyond the concerns of water is the risk of infestation when open foods are left out for invaders. Mice, ants, and even termites can be tempted into moving into your cabinets if enough food is present. Our recommendation? Keep any treats in your cabinets sealed up and protected from scavengers. Otherwise, you may come down one morning to find scratches, droppings, and a plethora of other unwanted signs of pests in your kitchen! One of the best ways to keep your kitchen cabinets safe and secure for the long haul is to treat the hinges and doors with respect. Simply put, pulling heavily on the doors of your cabinets can place a lot of undue stress on the wood and hardware, possibly shortening the lifespan of each cabinet in your kitchen. Kids especially are known to climb and swing on cabinets with ease. While this activity looks fun and you as the adult are probably a little jealous, the truth of the matter is that these actions can compromise the integrity of your handles and hinges. Not only is horseplay bad for your cabinets, it can also be a very serious safety hazard for your child! If you take care of your cabinets, chances are they will return the favor for years to come. If your current set is looking much worse for the wear, you may be able to choose cabinet refinishing over costly replacements! Detail Design & Remodeling is proud to be your source for quality cabinet refacing in the Atlanta area. Our experienced home remodeling contractors have the skills and equipment needed to provide eco-friendly and cost-effective solutions that can transform the look and feel of your kitchen cabinets. We focus on old-world craftsmanship to provide beautiful, durable results that are sure to impress guests and loved ones. Call us today to learn more or to schedule your appointment!